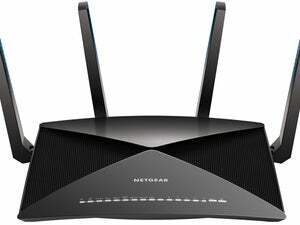 It’s not the right router for everyone, but there’s plenty to like and it’s priced right. Google delivers much more router than you’d expect for $129, but just one Google Wifi won’t be enough for most people. Unless you live in a studio apartment, you’ll want to avail yourself of two or three of these devices so you can deploy a mesh network. The master router and a single node probably would be adequate for the 2800-square-foot home we tested in, but adding a third node delivered a significant boost to the farthest corners of the house. Google encourages this approach by offering a substantial per-unit discount when you order a three-pack for $299. Google Wifi is a dual-band router, of course, operating on both the 2.4 and 5GHz frequency bands. Google describes it as an “AC1200 2x2 Wave 2” device, which means it supports two spatial streams simultaneously, and that it delivers maximum theoretical throughput of 300Mbps on the 2.4GHz band and 867Mbps on the 5GHz band. Unfortunately, Google Wifi does not currently support one important 802.11ac Wave 2 feature: MU-MIMO (you can read about multi-user MIMO in this story). Google tells me a firmware update will enable MU-MIMO down the road, but it doesn’t work now. That won’t be a big deal for most people, because there are so few MU-MIMO client devices on the market, and the ones that are available are limited to 1x1 spatial streams. In any event, your wireless devices will see just one SSID, and the router will automatically choose which Wi-Fi channels it will occupy and which network your wireless clients should join. As with Google’s earlier OnHub router—which can act as a node on this mesh network—the router will send statistics to the cloud so that Google’s servers can analyze your network’s performance. If the cloud determines that your network would perform better by utilizing a different channel, it will send a command back to the router to change channels. Each Google Wifi node has two gigabit ethernet ports. When configured as a router, one port is used to connect to your broadband gateway and the other is available for connecting to switch. 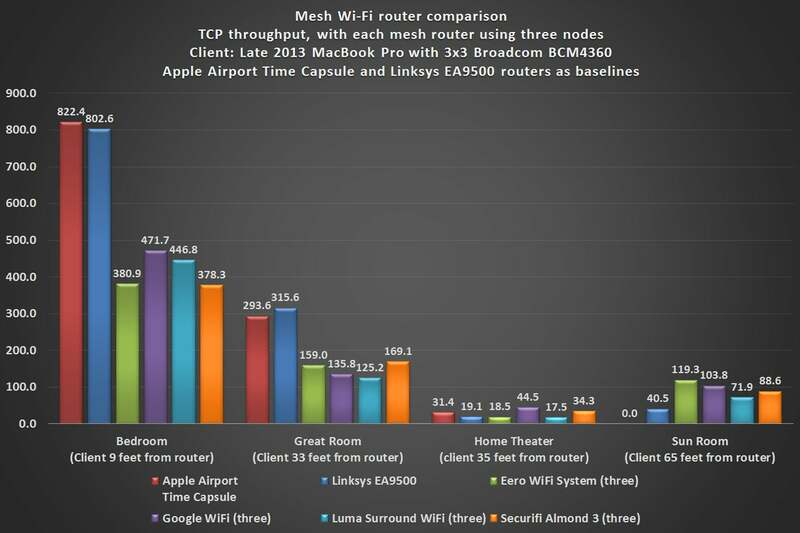 The router itself uses band steering to suggest that client devices move between its 2.4- and 5GHz networks, and client steering to suggest to the client when a better mesh point (node) becomes available as you move around the house. Hand-offs between nodes are completely transparent, and I never noticed any hiccups as I moved from one location to another inside my home while streaming video to my smartphone. 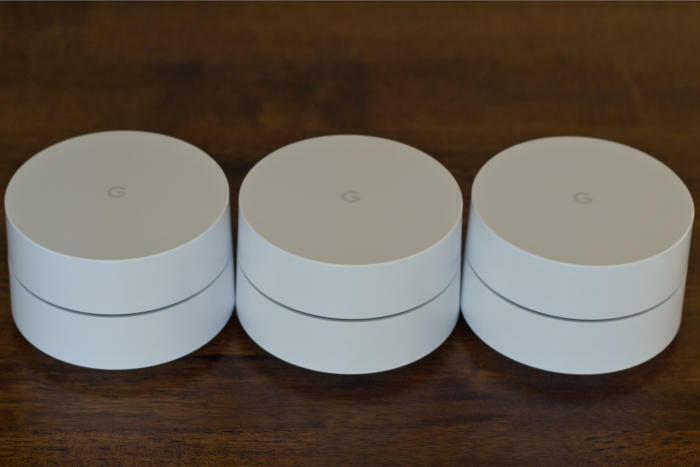 As is common with mesh routers (we’ll be reviewing several more in the coming weeks), Google Wifi is much smaller than a conventional router. The round device—it looks like a miniature layer cake—measures just four inches in diameter and is about three inches tall. It’s powered by wall wart with a six-foot-long USB-C cable, and like the OnHub router before it, it has just two ethernet ports. This chart shows how Google Wifi performs when operating with one, two, and three mesh nodes respectively. When used as a router, one port is used to connect to your broadband gateway and the other can be connected to a switch, an ethernet NAS box, or what have you. Deploy the Google Wifi as a node, and either ethernet port can be used for anything: wired backhaul, if you have hardwired ethernet in your walls; network storage; and so on. You can also use the node as a wireless bridge for client devices that otherwise wouldn’t be able to join your Wi-Fi network. A USB port is notably absent. Most competing mesh routers have at least one USB port, but none of the ones we’ve seen so far have been usable. 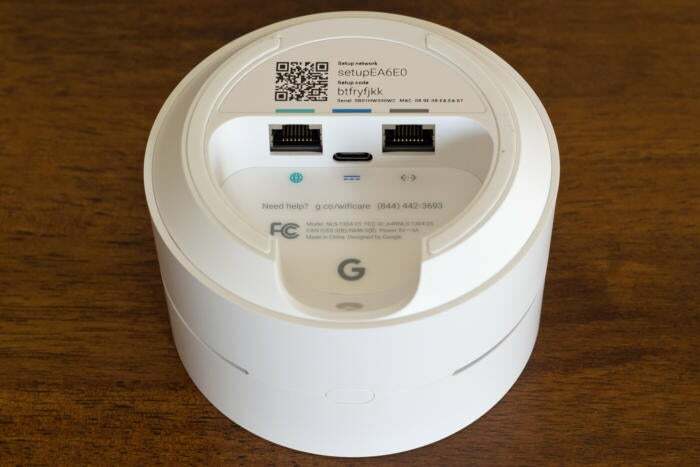 You’ll need an Android or iOS device with a camera to install a Google Wifi as either a router or a node. The app scans a QR code printed on the bottom of the router to identify it. The next step is to assign a location-based name for the router (Office, Kitchen, Den, and so on), so you can identify it later. The final steps in the process are to give your new Wi-Fi network a name and create a password for it. In this stress test, we performed TCP throughput tests between three paired computers while simultaneously streaming 4K video from the internet. 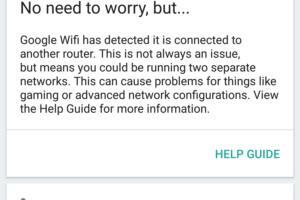 If your ISP gave you a broadband gateway/router, as is common these days, the app will helpfully inform you that the new router is now behind another router, which might adversely impact its performance. Google’s suggestion to remove the other router isn’t going to work in most scenarios. And Google’s other suggestion, to put the Google Wifi into bridge mode, comes with a “not recommended” footnote. Personally, I get around the double-NAT situation by configuring my ISP’s gateway to pass the public IP address through to my main router, so that it can handle network address translation. Google Wi-Fi was able to provide more than 100Mbps of throughput to a room that was 65 feet away from the router, a distance an Apple Airport Time Capsule couldn’t reach at all. The installation process takes just a few minutes and you don’t really need to know anything about how networks operate to get it done quickly. The router will even automatically download and install the latest available firmware, so that you’re protected from whatever exploits might be out there. Once your router is set up, you can perform an internet speed test to make sure you’re getting the upload and download speeds you’re paying your ISP for. You can also test your local network itself, but where the first test yields actual numbers, the second one just characterizes your network speed as “good” or what have you. Expanding the size of your mesh network with additional nodes is just as easy. 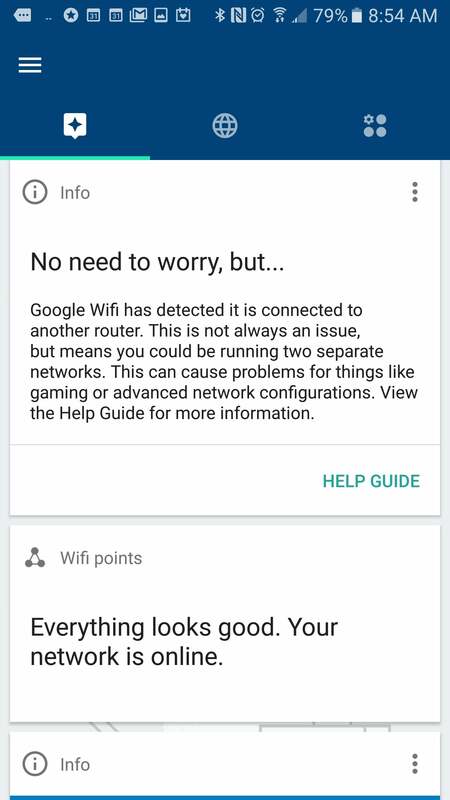 Google Wifi will warn you if you fall into a double-NAT situation. Google’s focus is clearly on everyday folk, not router enthusiasts, but it did leave some doors open for tweaking. You can create rules for port forwarding, make DHCP reservations, and choose which DNS servers are to be used, for example. And there are a number of features that both classes of users will appreciate, including the ability to assign specific network clients higher priority than others, so that you can ensure your Roku box gets all the resources it needs while streaming 4K UHD video. Creating a guest network is as easy as pushing a button, and you can display your Wi-Fi network’s password on your phone or even text it to friends right from the app. You can manage your Google Wifi network from anywhere you have internet access, and you can assign other users to be managers as well. 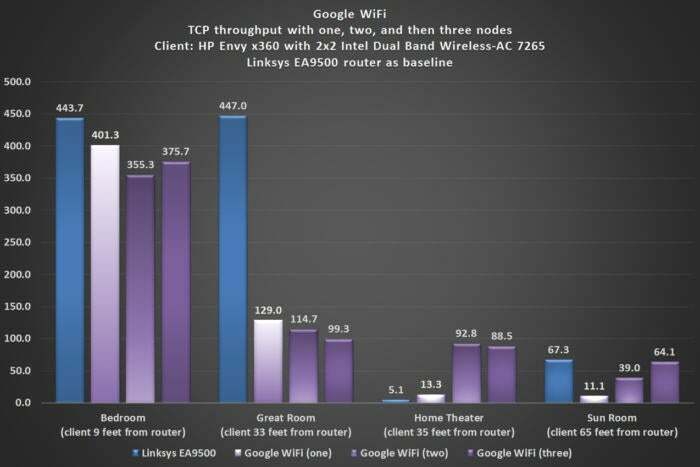 A single Google Wifi was nearly as fast as the more conventional Linksys EA9500 we compared it to—at least when the client was in the same room as the router. That Linksys router costs about as much as three Google Wifi’s. Throughput dropped considerably when the client was moved further away, but adding nodes consistently yielded higher performance at the more distant locations. 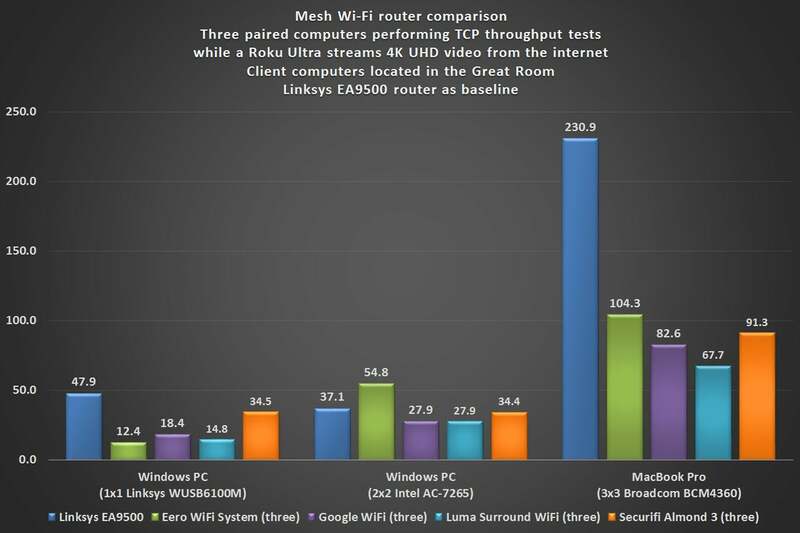 The Linksys could not deliver acceptable performance in the home theater and the sun room, for example, but the network of three Google Wifi’s made it possible to wirelessly stream HD video into those rooms. If you’re looking to get rid of dead spots in your home, this should do the trick. Google Wifi is for people who don’t want to fiddle with a router. It’s super-easy to install and it delivers very good performance across the board. You might have heard that Google Wifi can control Philips Hue smart bulbs, too—it can—but if you’re looking for a router that can pull double duty as a smart-home controller, you should take a long look at Securifi’s Almond 3 before you buy anything else. It is much more sophisticated in that respect than what Google is offering here. This story, "Google Wifi review: Mesh networking made easy" was originally published by TechHive. Google WiFi’s mesh network should eliminate the dead spots in your home, but it only scratches the surface of smart-home control.